Ted Kennedy defined the Conservatives in America, saying, "The Republicans are looking after the financial interests of the wealthiest individuals in this country." 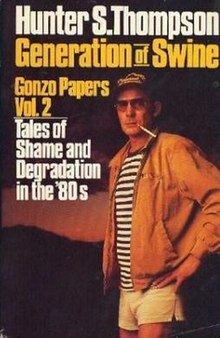 The Conservatives are the Generation of Swine that the great journalist and satirist Hunter S. Thompson wrote about, "where thieves and pimps run free." We start with a definitin of "swine." 2. A person regarded by the speaker with contempt and disgust, as in: "What an arrogant, unfeeling swine!" "Court Blocks Racist Tea Party Gov. 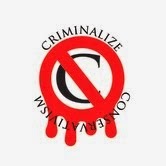 Jan Brewer’s Plot to Deny Driver’s Licenses for LEGAL Immigrants!" "An August, 2012 executive order issued by Arizona governor Jan Brewer denying public benefits like drivers' licenses to young immigrants who have work permits has been struck down by an appeals court..."
Another Conservative pig has decided that there's another reason to kick out refugees from the most murderous countries on Earth, conveniently forgetting a certain plea from a Nation of Immigrants: "Give me your tired, your poor, Your huddled masses yearning to breathe free, The wretched refuse of your teeming shore..."
"Louie Gohmert: Obama Is Bringing In Central American Immigrants To Vote Illegally For Democrats." "Speaking with Newsmax host Steve Malzberg yesterday about the influx of Central American children and families at the Southern border, Rep. Louie Gohmert implied that President Obama was orchestrating the crisis in order to recruit millions of people to cast fraudulent ballots for Democrats and seize Texas from Republican control. "'In the end, they have said that they want to turn Texas blue, they want to turn America blue,' he said. 'And if you bring in hundreds of thousands or millions of people and give them the ability to vote and tell them — as Quico Canseco said, he had illegals in his district that were told, "If you want to keep getting the benefits, you have to vote, and President Obama’s lawyers are not going to allow them to ask for an ID, so go vote or you’re going to lose the benefits you’re getting now." That drives people to vote and it will ensure that Republicans don’t ever get elected again.'" "The Texas Republican also told Malzberg that the Central American refugees, combined with the end of the gold standard during the Nixon administration, will bankrupt the country." 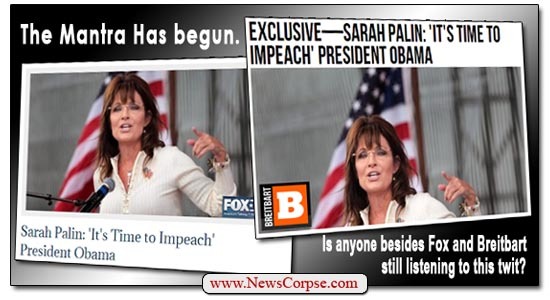 "Impeachment Fever: America Rejected Sarah Palin, Now She Rejects America." "The 'Quitta From Wasilla' is making headlines again by displaying symptoms of acute Obama Derangement Syndrome. Sarah Palin, the 2008 GOP nominee for Vice-President, who was soundly rejected by American voters, is now calling for the impeachment of President Obama (again), who was elected twice with significant majorities. "Enough is enough of the years of abuse from this president. His unsecured border crisis is the last straw that makes the battered wife say, 'no mas.'" people who don’t need help. That’s all there is to it."